Today President-elect Barack Obama and family will move into an historic house on Pennsylvania Ave. in Washington D.C.  and no, it's not the White House. It's Blair House, a complex of four homes right across from 1600 Pennsylvania Ave. where the Obama family will stay for the week leading up to the Inauguration. It's been called "the world's most exclusive hotel," "Uncle Sam's guesthouse," and "the best small hotel in Washington," and rightly so. 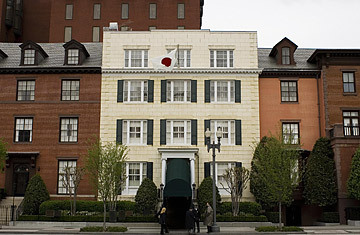 Since 1942, the Blair House has been the B&B of choice for former presidents, incoming Presidents, and major leaders from around the world, including Margaret Thatcher, Ariel Sharon and Emperor Hirohito of Japan. It's so exclusive that when the Obamas asked to move in a little early so their daughters could start school on Jan. 5, the President-elect and his wife were told they had to wait their turn. ('SORRY, WE'RE BOOKED,' WHITE HOUSE TELLS OBAMA was the New York Times headline.) Apparently Australia's former Prime Minister, John Howard, had already had dibs. When a Blair House decorator sent Barbara Bush a note about minding the fine china during George H.W. Bush's pre-presidential stay in 1989, the First Lady-elect sent her own note back: "We're playing football with the china. Don't worry about it, everything will be mended with Elmer's glue." But at 184 years old, Blair House has also seen its share of historic figures and moments. The first of the four buildings was built in 1824 by Dr. Joseph Lovell, the first Surgeon General of the United States. Its second owner was Francis Preston Blair, a Kentucky journalist whose favorable coverage of President Andrew Jackson helped him land an editorial position at the pro-administration D.C. newspaper, The Globe. Blair, whom Jackson had personally invited to Washington, moved into 1651 Pennsylvania Avenue in 1837. It remained in his family for the next 100 years. It was at Blair House that Robert E. Lee turned down Abraham Lincoln's request to lead the Union Army; where General William Tecumseh Sherman married the daughter of the Washington Senator who had adopted him; and where Presidents Martin van Buren and William H. Taft sought Blair's counsel. (Apparently as in real estate, politics too is all about "location, location, location." From his residence at 1651 Pennsylvania Avenue Blair became a "Kitchen Cabinet" member to many a president after Jackson). Eleanor Roosevelt finally insisted her husband have the government buy the place in 1942 after she caught Winston Churchill wandering the White House corridors in his nightgown one night. Good hospitality makes for good diplomacy, she insisted, saying the White House had simply become too crowded. Even so, she later joked of Churchill's visit: "Such fun." It was purchased for $150,000. When the Obamas settle in, they'll be greeted by mementos and antiques that commemorate the nation's past  Robert E. Lee's signed resignation to Lincoln, the badge of the policeman who was killed saving Truman's life, the same portraits that hung in the sitting room where the Marshall Plan and Truman Doctrine were hammered out. Today it also contains furnishings and various bric-a-brac donated by House and Garden, General Electric, and Elizabeth Arden among others. During the Blair House's last facelift, Congress agreed only to pay for its structural improvements. For decorations and other such amenities, they refused to foot the bill.